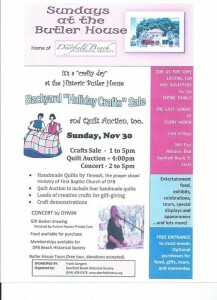 It’s another “Sundays at the Butler House”…..Crafts and Quilt Day…… November 30, 1-5pm, 380 E Hillsboro Blvd, DFB. 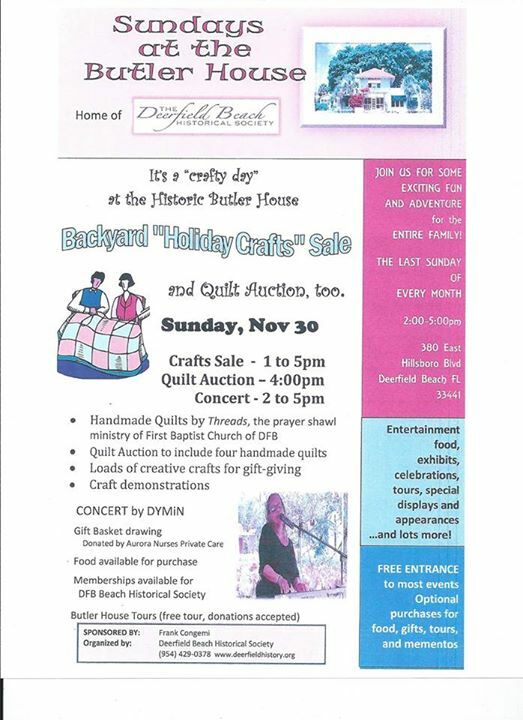 Threads, the prayer shawl ministry of First Baptist Church of Deerfield Beach, will hold a silent and live auction of four quilts, all professionally designed, sewn, and “quilted.” Come bid on one of these gorgeous quilts and enjoy a special piece of art for your home or a gift for family or friends. In addition, there will be lots of food, music by DYMiN, free gift basket drawing (compliments of Aurora Nurses), free Butler House tours, gift-giving opportunities…,..and lots of local crafters displaying their creative works under the 100-yr-old Banyan Tree in the Butler House backyard!